Working in Shah Alam often means limited choices for dinner, as most of the eateries seem to cater instead for lunch. Luckily there's this place, well hidden in an industrial area that offers good restaurant food. We first discovered this place in 2006 and that blog post sparked off an interest for this eatery, that it was blogged to death. Suprisingly, it has survived through the times and recent visits to there confirmed it still serves generally good food. 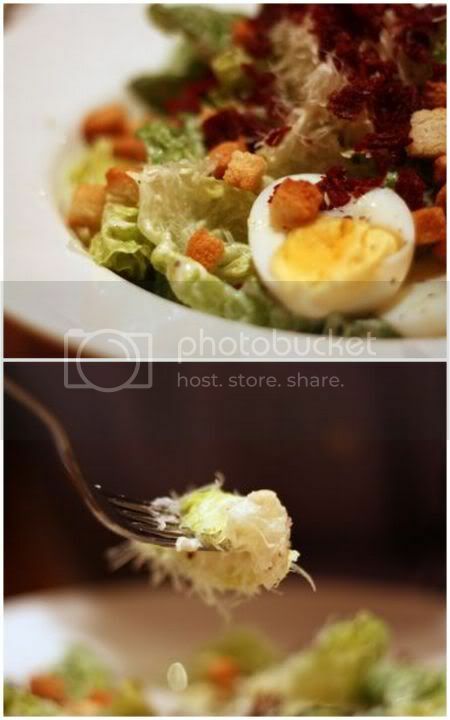 Our recent visit was very promising as we simply loved their Caesar salad - crunchy romaine lettuce topped with feather light grated parmesan cheese and topped with beef bacon. Simply yummy, was how Splashie Boy described it. 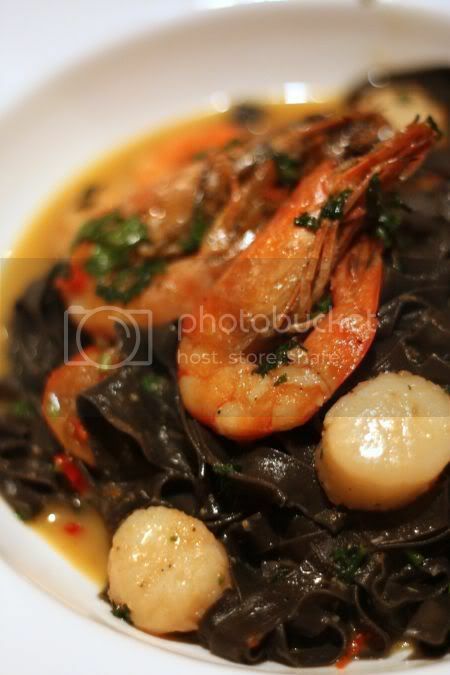 Even my squid ink pasta with seafood that came with a tinge of spiciness was very good. However last night when we dined there, it was a different ball game for us since we sampled other items. My braised lamb shank (RM32.80) was good but not exceptionally fantastic. It was fork tender but the sauce seemed to lack much spices and oomph. Even the grilled rib eye was a dissapointment as it was not tender but on a slightly chewier side. Luckily their home made crab cakes saved the day but we did leave feeling a little unsatisfied with the meal. Am not sure whether it was just our "spoilt" tastebuds or we had just picked the wrong items. Nevertheless, I reckon we should have stuck with the safer choices - pasta and salad as that never seems to dissapoint. I just realised I've yet to blog about this place. How weird, as I've been here numerous times, but never got around to putting it down on the blog. 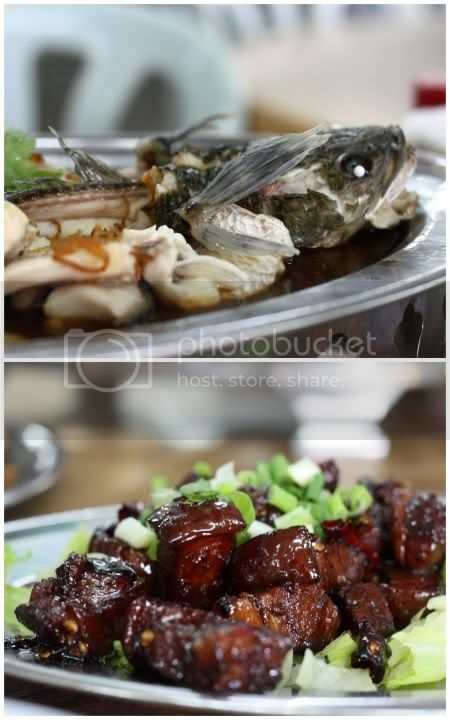 Here's another gem in Seri Kembangan village, a place on the main road that serves superb steamed sang yue or snakehead. Originally a bak kut teh joint, they expanded their menu to include tai chow like dishes after the JE scare affected their business. Bak kut teh is still available in the mornings but instead, people make a beeline for their sang yue dishes. Well known for the smooth texture but extremely troublesome to eat with all the teeny weeny bones, Yap Yin's version makes life so much easier - boneless fillets (RM26 for a small portion) tenderly steamed that you can pop in the mouth to enjoy. Aside from the steamed version (one of their most popular requests), they also do a porridge steamboat (boiled with sang yue bones to give it a sweet flavour) where you can dip plus swish the sang yue sashimi slices like shabu shabu. Aside from the fish, Yap Yin also serves one of the most tummy comforting Hakka yellow rice wine chicken dish (RM20 for a small). It got the approval of my aunties and mother when I brought them here one day to sample the steamed fish. More of a Hakka traditional dish, it is made unique because of the fragrant homemade rice wine. 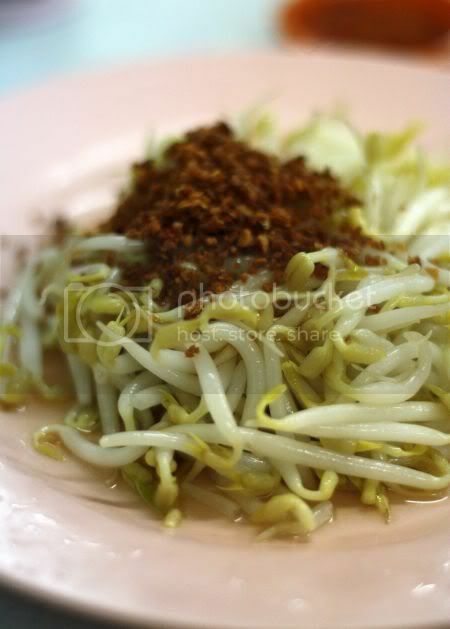 On my last visit, I bought a bottle of the rice wine for RM15 home, hoping to recreate this wonderful dish at home. 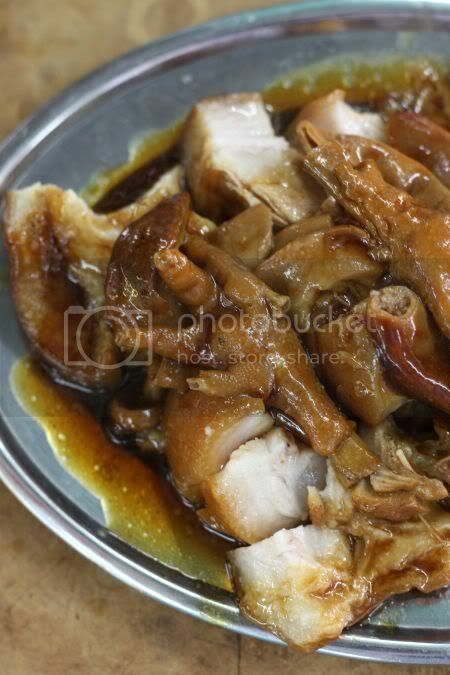 Other great items you can also order - their signature stewed pork trotters, intestines and chicken feet (RM15 for a small portion), a delicious combination of sinful melt in the mouth fatty bits of the pork with a hint of Chinese herbs. We also tried a new dish - the cheong pau yoke (RM16 for a small portion), pork belly slices coated in a sweet but spicy sticky sauce. Parking is quite a nightmare here though, since the restaurant faces the main road. The owner tries to make it up by setting up spaces at the houses nearby but it's quite limited. Nevertheless, I don't mind walking a bit further to get here, as the food's good. I never tire of Japanese food. Throw me in Japan and I'll be one happy camper since I love all kinds of Japanese food, whether it's raw sashimi, home cooked food like niku jaga (potato and beef stew) or yakitori. What I'll probably won't enjoy is the Windows 7 Whopper - Burger King Japan's tribute to Windows 7 launch. There's 7 burger patties all together for Yen777, for 7 days. Luckily it wasn't Windows 6, or else it'll be the devil's favourite numbers which will be so appropriate for Halloween. Eat Me Daily (my current favourite daily click of the day!) has pictures and a video of the Whopper. Watch how 2 people tackle the giant with various eating styles. Love the quip at the end, when the fella said he's glad it was not a Windows 95 launch. 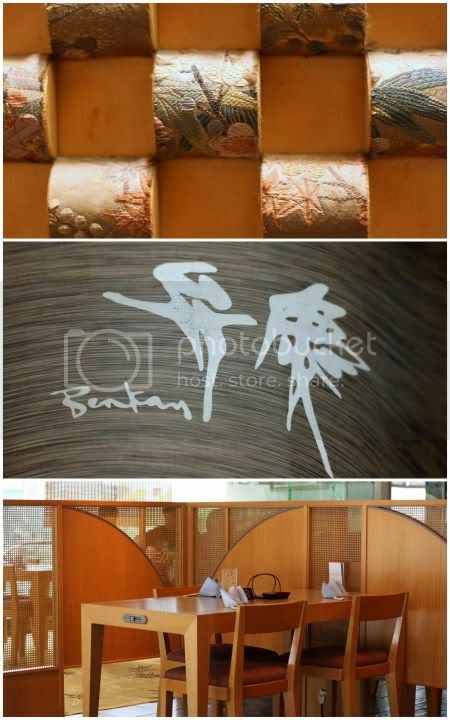 Since we don't have Windows 7 Whoppers here, it's all about Japanese food at Benkay, one of the places I've heard quite a lot about but yet to try. Being new to the place and because the prices here are more akin to hotel ones, we decided to be a little "kiasu" and go for the set lunch first. My theory was if the sets wowed us, we'll be back for the more expensive items and etc. Surprisingly, we were bowled over the simple yet delicious Chicken Yosenabe Set (RM55). 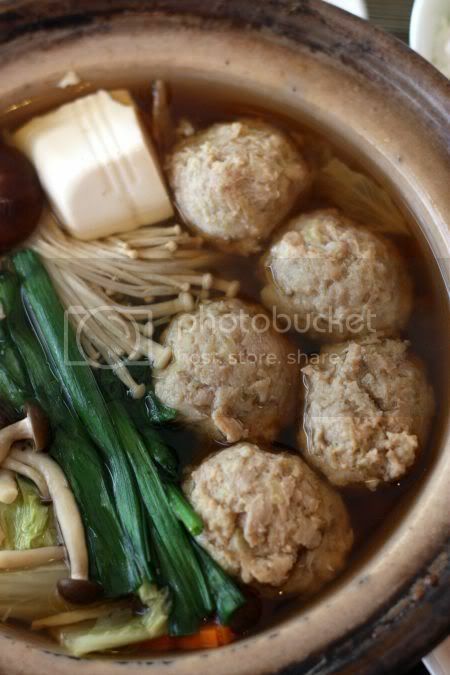 Believe me, it's comfort food for your senses - large fluffylike minced chicken balls with finely chopped ginger and cabbage within. 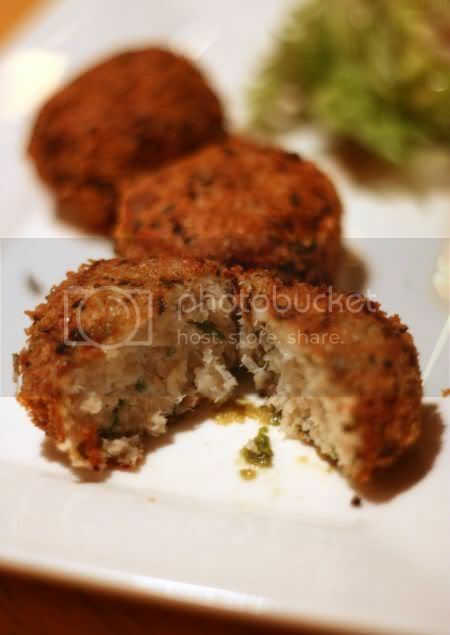 In fact, the soft texture reminded me a little of Taiwanese lionhead meatballs. 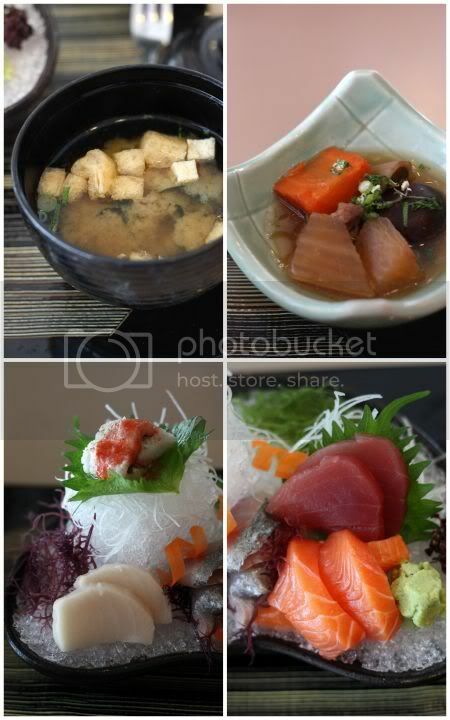 1. miso soup, 2. braised dish, 3. tuna and salmon, 4. my "hill"
My sashimi set (RM65) was artfully presented with lots of different coloured seaweed and even some purple cress on the side. I especially liked how they shaped a small little "hill" in shaved ice for my simple piece of cuttlefish. The sets all come with a braised dish of chicken with daikon and carrot, smooth chawan mushi, a tangy corn salad and fruits. While prices are definitely on a higher side compared to other places, I must admit we were very satisified and would not mind returning again. Set lunches were also available during the weekend, which is a plus point. They have a new Japanese chef who used to helm Zipangu and Mizu, hence I'm sure food is good here, since we both love the other places. Don't you just love the double connotations of Chinese words? This place (formerly known as Zhui Mao or the Drunken Cat) reminds me aptly of the twins, Fook Mi & Fook You from the Austin Powers movie. Despite the surreal sounding name, food here is more honest to good Chinese food. 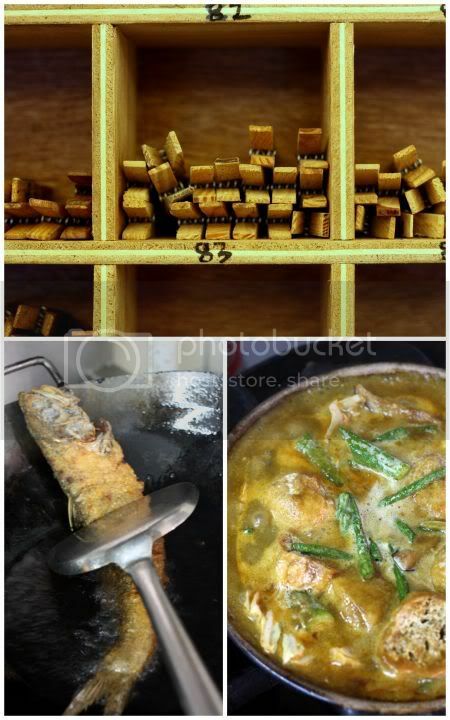 A must-have is the steamed tilapia, a dish that this restaurant has perfected since 1985 when they started business in a wooden shack on Jalan Peel. Not only was the fish perfectly steamed, we absolutely love the flavours of the cheong cheng sauce, a harmonious blend of soy bean paste and chillies. Coupled with fried lard bits, this was so incredibly addictive, I ended up eating most of the fish. 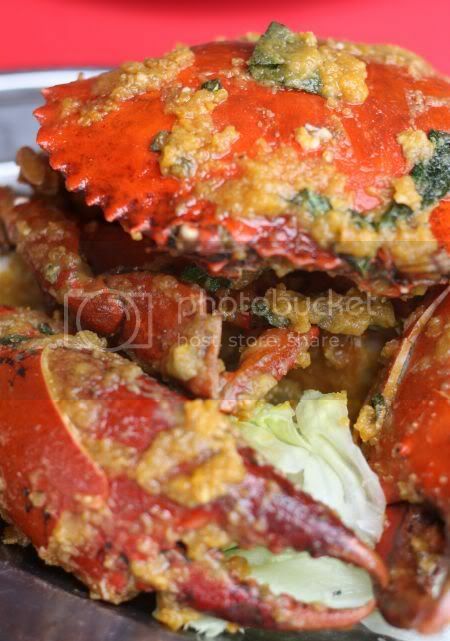 Other specialties here include their impressive looking salted egg yolk crab, prepared in a different way from Robson Heights as the salted egg yolk sauce is loose and does not adhere to the cooked crabs. 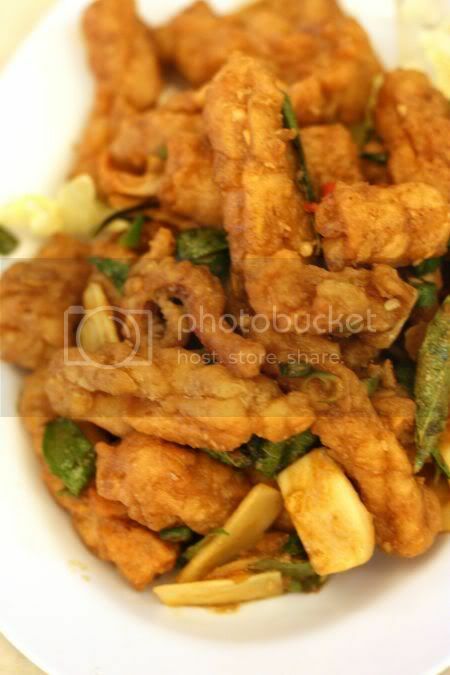 Moreover the crabmeat does not absorb much of the salted egg yolk sauce. Nevertheless the crabs here are huge, as they're from Indonesia. Another recommended dish was these spicy prawns served in a mini wok. Sadly, it didn't hit the right notes for the tongue at all with the not-very-spicy nor tasty sauce coating the large prawns. 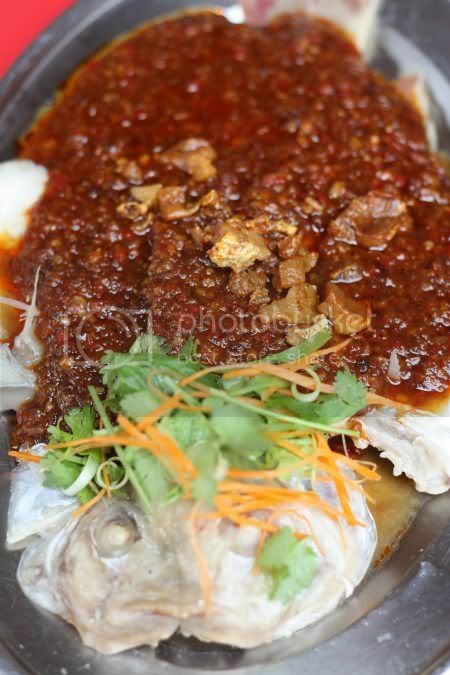 Despite some misses, I reckon I'll still return as I absolutely love the steamed fish here. They also do other kinds of sauces i.e. ginger, assam, nonya, thai and etc. Another branch run by a sibling is also open in Sungai Besi. Upset because Beyonce postponed her concert in Kuala Lumpur this weekend? 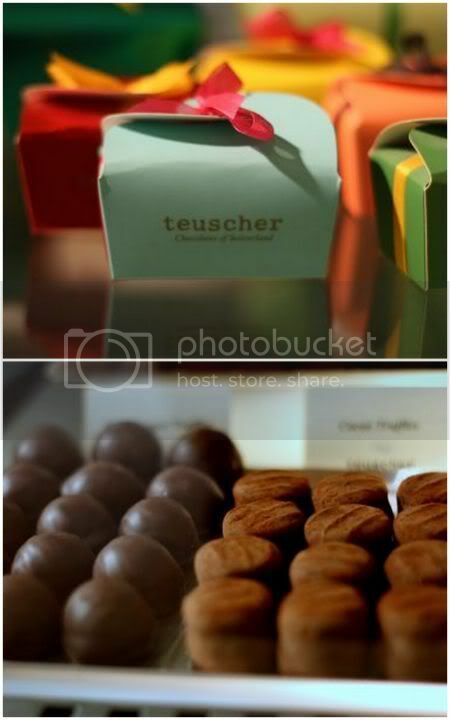 My advice.....console yourself with some champagne truffles from Teuscher. Flown in from Zurich, these freshly made chocolates make life a lot brighter after you have popped one in your mouth. Available in milk or dark chocolate, within each truffle, there's a soft creamy centre made from Dom Perignon champagne. A soft fluffy dark chocolate ganache covers the champagne centre before it is enrobed in another layer of thicker chocolate coating. Lastly, it is dusted with icing sugar for the milk chocolate variety or cocoa powder for the dark chocolate variety. What makes it unique to the tastebuds - the chocolate has a decadent, soft and almost airy texture, making it easy to bite and indulge in. 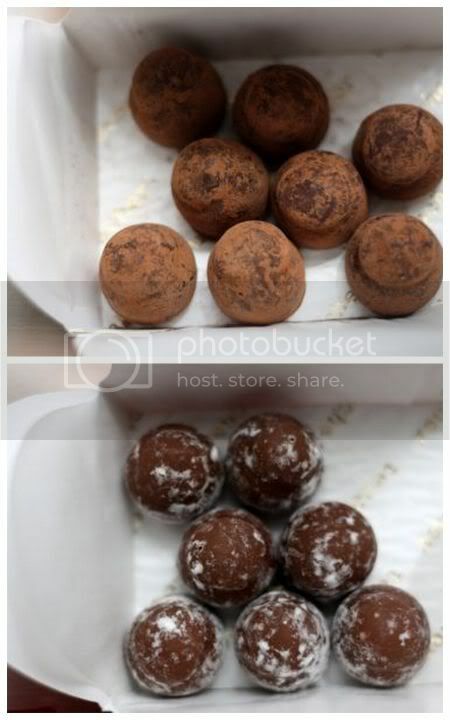 These delicate truffles (there's a long list of how to look after them including no direct sunlight) sell out pretty quickly hence it is best to leave your name on the list and the shop can call you, when the supplies come in. Usually they get sold off within one week after they arrive from Switzerland due to their popularity. As they're freshly made from butter, cream and chocolate, it is best to consume them within 10 days (not a hard task believe me!). 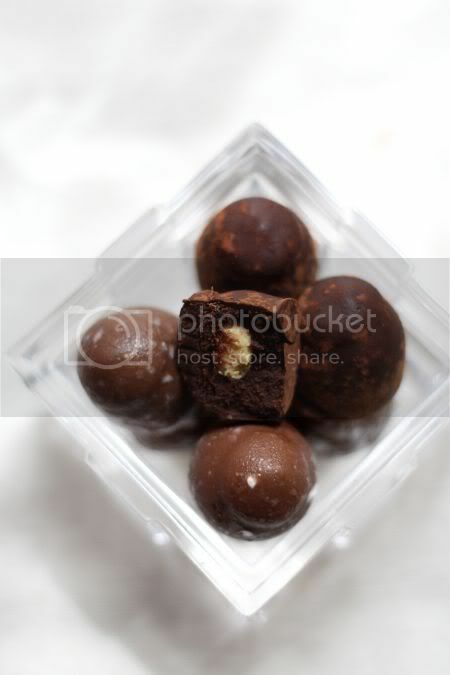 Teuscher claims to be the first to have come up with the idea for champagne truffles in 1947. During a heat wave in Zurich, Adolf Teuscher Sr was said to have saw a champagne bucket that inspired him to create a chocolate that has a "fresh and cooling taste". 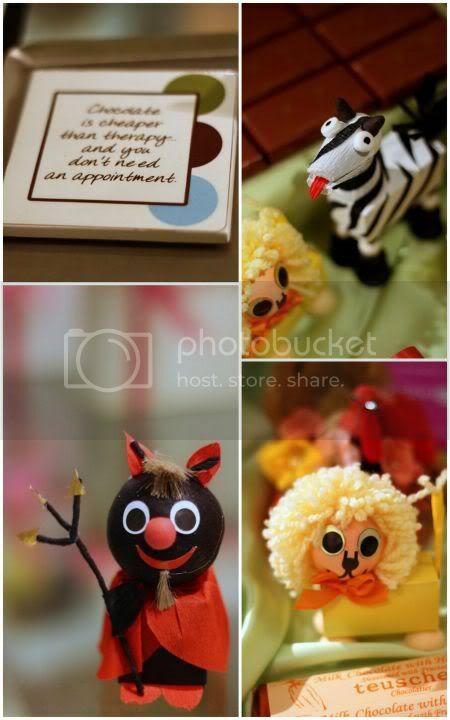 The quaint little shop in Bangsar Shopping Centre is also a great place for snapping cute little paper crepe animals and characters. As Halloween is just round the corner, there's adorable looking witches, ghosts and even a devil-like figure on display. Aside from the champagne truffles, they also sell various kinds of truffles (spied a wine one), chocolate in various shapes and bars. There's also hot chocolate available with a few tables and chairs on the side for you to indulge in the rich dark beverage. More pictures can be found in my Flickr set. 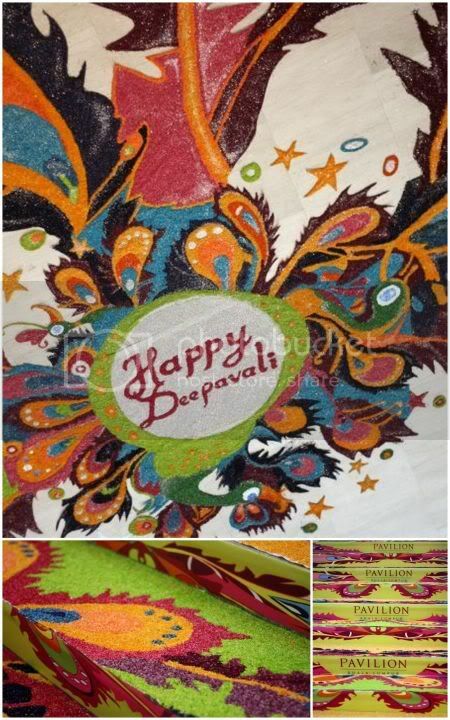 Happy Deepavali everyone! Such a riot of colours for the festival of lights. Every mall, hotel and office seem to have outdone their artistic skills this year with all the kolam displays. 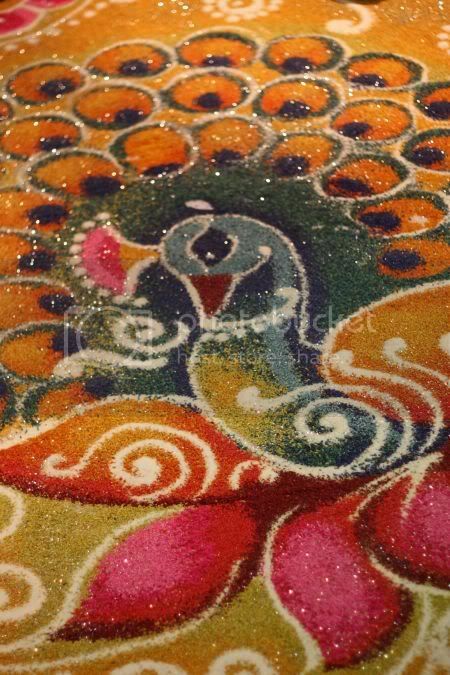 Made from coloured rice grains, the kolam is multi-functional, it decorates and is also said to purify the entrance of the building inviting the godness of Wealth to enter. 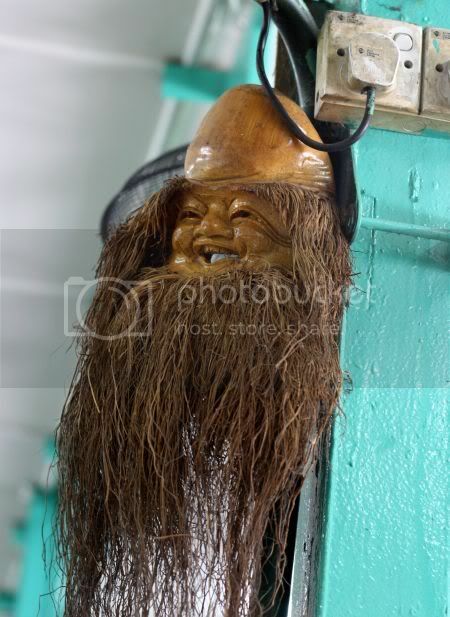 Kinda I guess like us asking Choy Sun or the Chinese god of prosperity to bless the house/office/mall with wealth. One the decadent ones I saw this year is located at Pavilion KL - studded with Swarovski crystals. Literally a bling bling fest, I reckon. 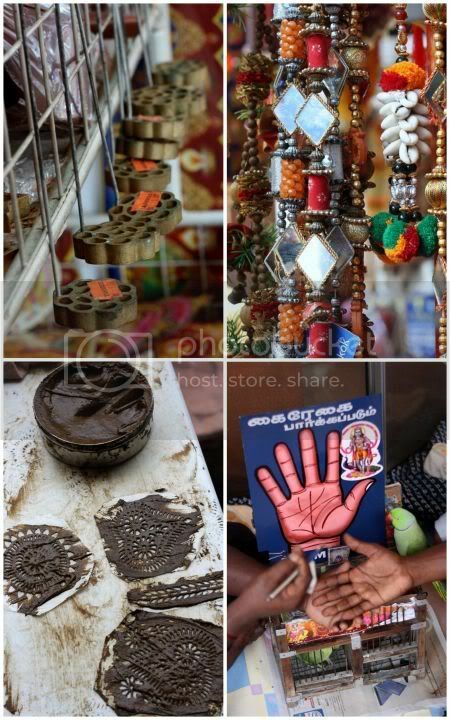 Every year, I often hit the Deepavali bazaars to soak up the atmosphere. This time round, instead of the more commercial Brickfields, it was the quieter Little India at Klang, with its old world charm. I love how the streets are lined with colourful sweet stalls, fortune tellers with birdies to pick cards that give a peek into your life, incense smells and people enjoying the festivities. The town is flooded with people coming from neighbouring small towns to shop for new clothes, decorations and sweets. As the streets are packed with people, a number of volunteers are distributing free drinks to quench their thirst in the heat. Amid the hustle, we managed to do two stops, one for lunch at the 46-year old Jai Hind - a dose of banana leaf rice and ragi. One fascinating stop was at Ashoka Curry House, a modern place that serves the unique looking Madras Masala Milk. Tinged yellow from saffron threads, this milk is prepared in a cast iron wok and includes aromatic ingredients like hazelnuts, raisins, pistachios or pista, cardamom pods, dry ginger and herbal nuts. 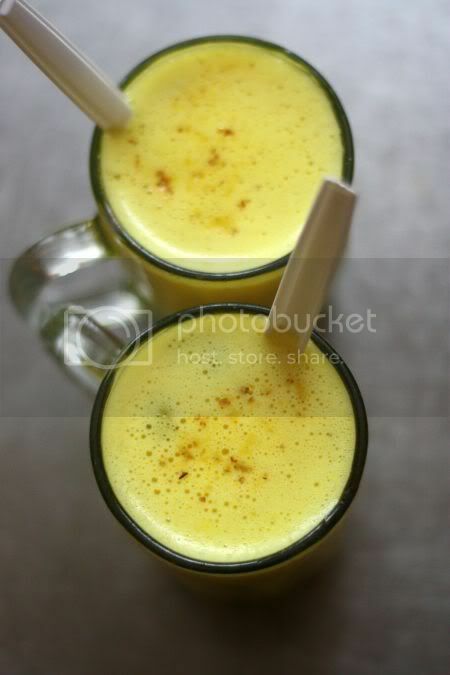 The frothy concoction is tummy comforting and reminds me of payasam, a dessert I love with sago pearls. Sweets are piled high and in every rainbow colour imaginable. 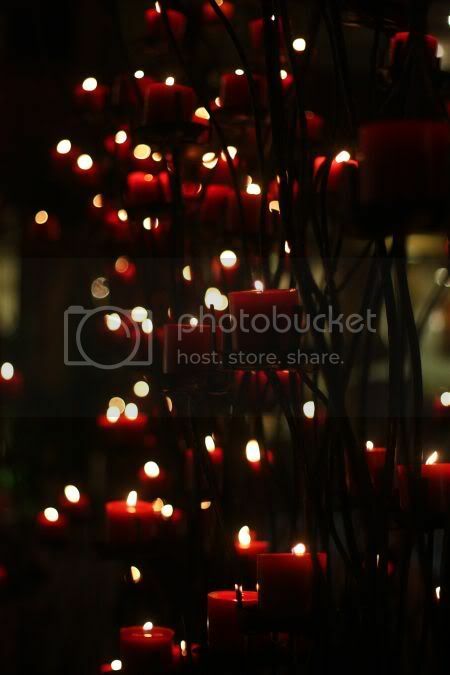 These are essential for the celebrations, as they are used for prayers and served to guests, when they drop by. My favourite is still the gulab jamun - these balls soaked in syrup flavoured with cardamoms and rosewater. 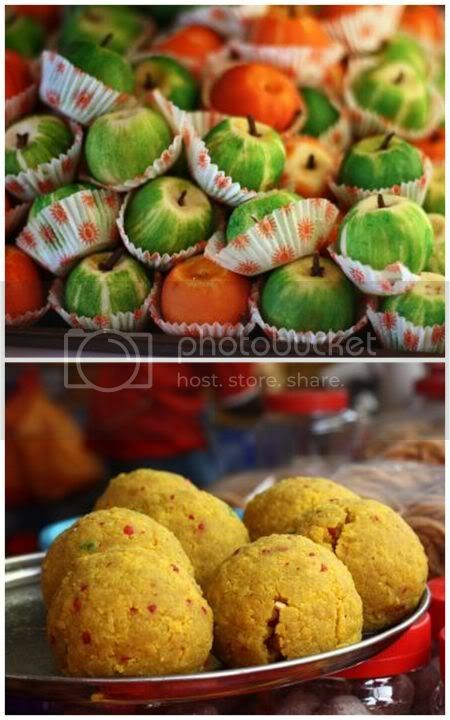 There are also an assortment of ladoos - multi-coloured ones and super size ones that are used for prayers. Don't forget the crunchy bits we know as muruku, they're addictive - one scoop in your hand is never enough as you keep digging into the tin to grab more of the crispy batter bits. 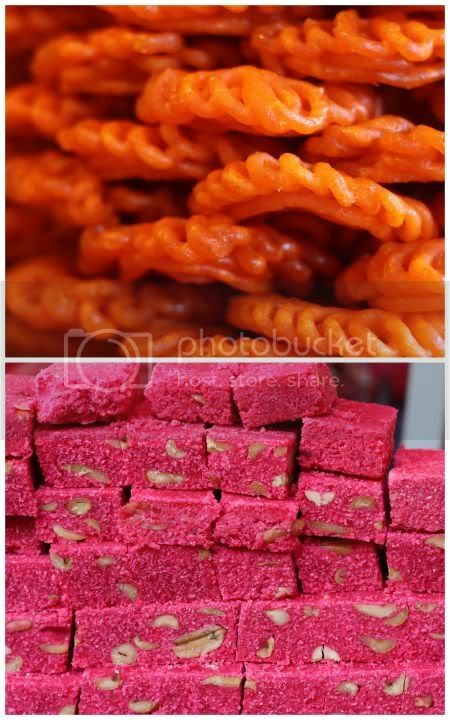 For more colours of deepavali, see my Flickr set. Food for thought - Should bloggers disclose when they receive freebies or cash for a product review? should we be kept in the dark for blogger reviews? Let's kick up some dust, just before we end the week with a scary question i.e. should bloggers be regulated to disclose either cash or freebies they receive for product reviews? Why? You may ask, am I asking this suddenly. Well, it just happens the US Federal Trade Commission (FTC) has decided to start regulating bloggers on this disclosure issue, last week. That has sent a buzz around the online community and even made its way to Singapore, where their Media Development Authority (MDA) claims it is looking into ways for stricter disclosure rules. One wonders, how long before the Malaysian Communications and Multimedia Commission will also jump on the bandwagon too. Let's analyse the FTC guidelines that were released in relation to "Guides Concerning the Use of Endorsemens and Testimonials in Advertising." Per their guidelines, "a post from a blogger who receives cash or in-kind payment to review a product is considered an endorsement". The guidelines continue to say, "bloggers who make an endorsement must disclose the material connections they share with the seller of the product of the service." No mention about the kind of disclosure is required, as that is left to the blogger but it is required to be clear and conspicuous. What happens when you violate these guidelines you ask? It is stated that if you regularly flout the guidelines or complaints are made, a fine of USD11,000 will be imposed for each violation. Already in Singapore there has been fiery exchanges on the Net with comments claiming this is a violation of blogger privacy. I guess, since this is more of a food blog, one must ask this question, would you as a blog reader want to know when you read a blog post recommending a certain outlet for food, whether it is made clearly on top of the review, that it was an invited review where food was received as payment in kind or that particular blogger received a sum for writing that review? Definitely food for thought, for all of you to chew on. Let me know your opinions and whether these FTC guidelines will be applicable here in Malaysia. For further reading on this, see Wired's article on the FTC guidelines and Singapore's reaction to MDA's proposal to regulate bloggers. I also like this blog post from the Singapore Straits Times on how difficult it will be to police these regulations. One suggestion is to go after those companies that continues to practice these kind of reviews. It's sad, when a legendary place like Ho Weng Kee in SS2 closes down. The owner has been threatening to retire for quite some time and he finally did so, supposedly due to his poor health. Taking over their former space is another famous char siu wantan mee place that used to be at Section 17 Restoran Mel's Corner. It is thanks to one of my blog readers aka carsam carsam, who informed me of this change. He wrote about the Section 17 noodles for the Knife/The Star's competition on food places. Nothing much has changed here except the shop is now called Chan Meng Kee (the owner's surname is Chan). 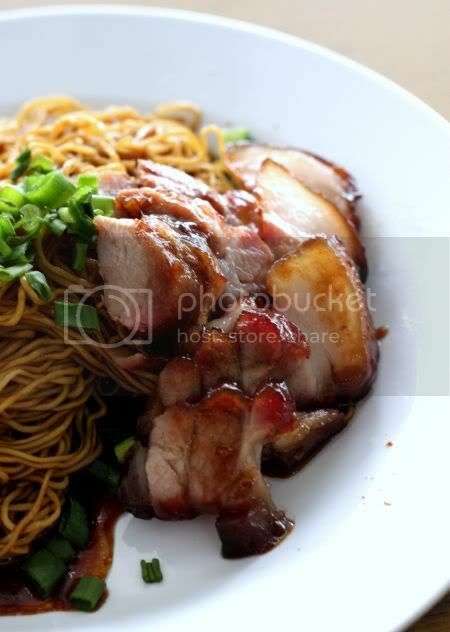 Previously in Section 17, the stall only sold char siu wantan noodles, here they have expanded their selection to include roast duck, curry noodles, ngau lam noodles which is quite similar to Ho Weng Kee's previous offerings. 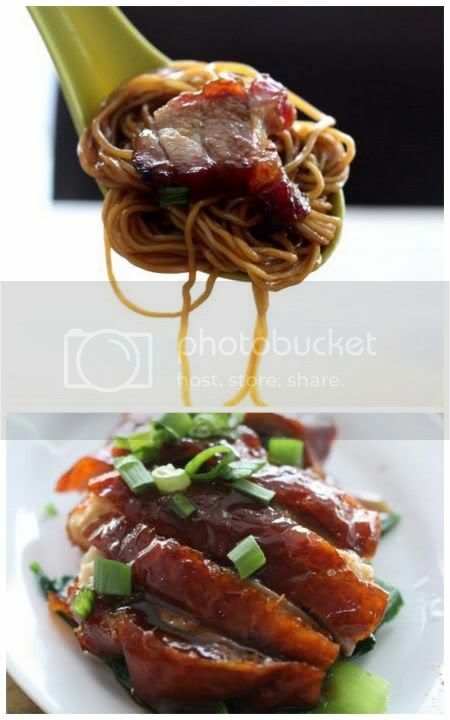 Tastewise, the char siu was very good - chunky melt in the mouth pieces with a generous portion of springy wantan noodles for RM5. The wantans on the side, wasn't as tasty compared to their days in Section 17 (a lack of dried sole powder) but was still quite decent. I thought the roast duck (RM5 for one portion) was average tasting - not much meat and instead all I got in one mouthful was a lot of skin. Nevertheless, I'm curious to return here and try their ngau lam (beef brisket) noodles and curry mee to compare it with Ho Weng Kee. I doubt the old owners pass their recipes to these people, as when I asked them if they were given the recipes, they kinda ignored me. So sad, since those recipes will be lost forever. After a long stressful week, winding down with a little porky goodness seems to be the best way to recharge the batteries. This relatively new place located in the heartland of SS2 seems to have garnered quite a few fans already, judging from the crowd hanging out at the small place and the number of references once you Google search it. Don't expect much in terms of decor, as the place doubles up as a shop to sell the meat in the front and a large open kitchen takes up almost half of the space. The whole set up is relatively simple with mirrors on one side, to give an illusion of a bigger space. Tables and chairs are also quite limited, hence I can imagine looking for a place during peak times will be quite trying. The lack of any soft furnishings and mirrors does no wonders for the acoustics, as it can get terrible noisy especially if there's a loud crowd hanging here. If your aim is just some pork to cheer you up, then you're in the right place. 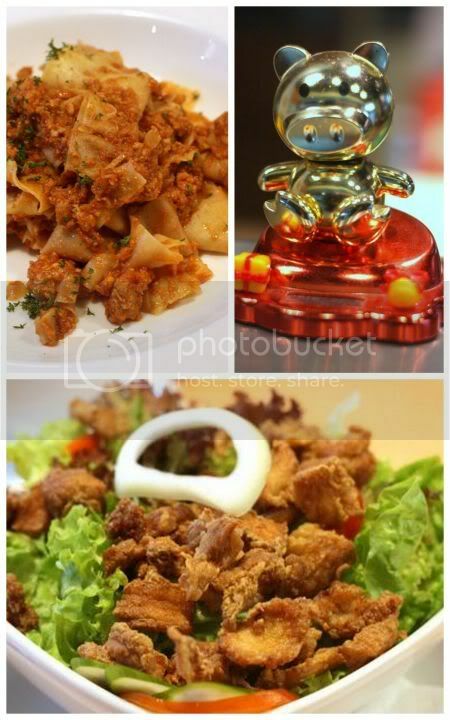 The menu is relatively small - appetizers, pastas, mains and desserts. They have handy indicators next to some items to help you order their specialties. Spotted pork ears on the menu (I wonder if that will be too chewy? ), pate, pork burger and etc. Since we couldn't eat the whole menu, we just settled on a few items. The pork bolognese arrived first, looking a little lost in the large white plate. A quick taste of it revealed pretty good home made pasta - not too soft but still with a slight bite to it. 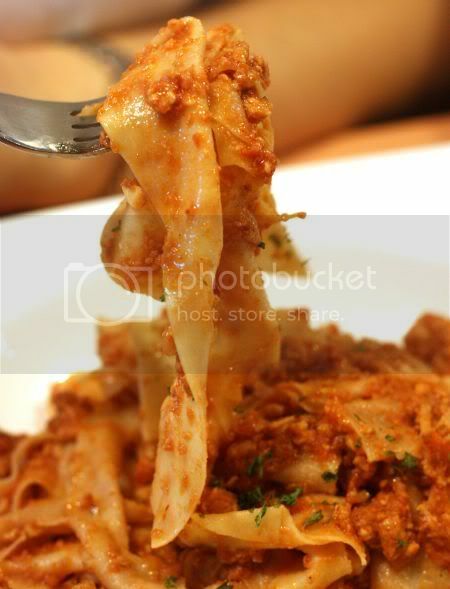 The pork bolognese that coated the thick pappardelle strands was strangely reminscent of a home cooked meal - comforting and familiar. 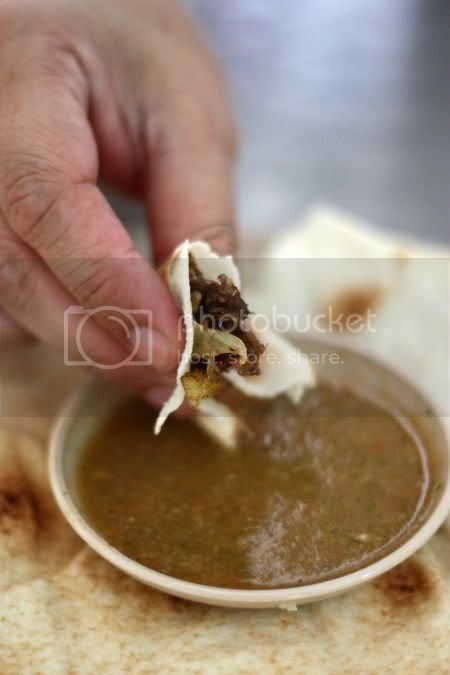 Well hidden within the minced meat, you will find bits of deep fried lard that is a little soggy from the sauce. I guess it would have been better to sprinkle the pasta with the deep fried goodies on top, to give a slight textural difference. Nevertheless, we both thoroughly enjoyed the pasta and decided we don't mind trying it again. The sinful sounding pork belly salad felt a little ordinary though and probably due to the moisture from the salad, the deep fried pork belly slices weren't as crispy as we preferred. It still made a good and less sinful accompaniement to the meal with the healthy greens dipped in a tangy honey mustard sauce on the side. 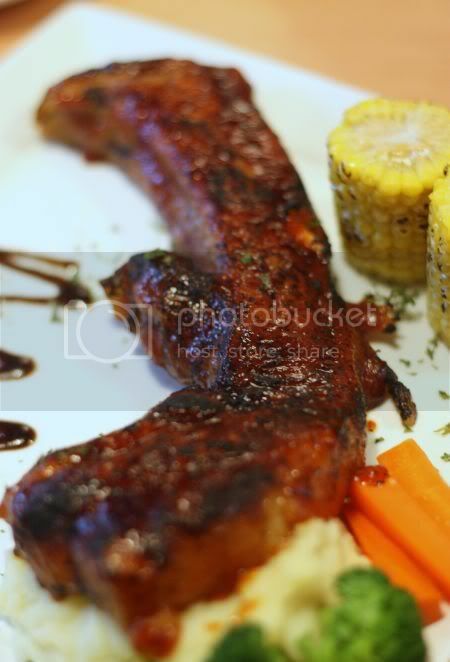 What we truly loved was the BBQ rib - one long rib slathered with a smoky BBQ sauce. Dig into the rib and discover fork tender meat topped with a fatty portion that melted in your mouth - simply sublime stuff especially for those who love their pork fat! The sides of mash potatoes was a little too gluey but I quite liked the sweet tasting grilled corn in the cobs. 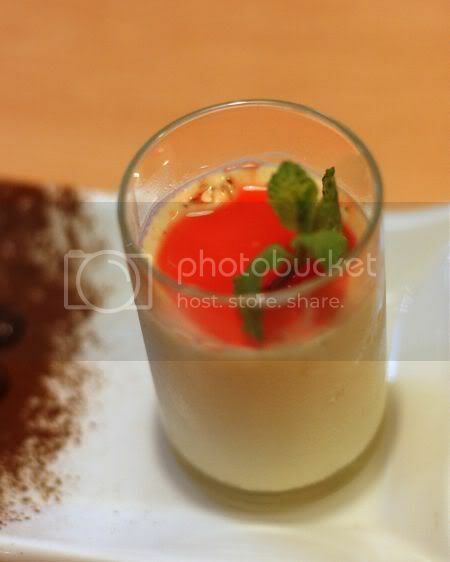 Dessert was less exciting - a wobbly and very soft pannacotta that didn't have much taste of pistachio at all. Dragonfruit was served on the side that didn't seem to complement the flavours of the dessert at all. I reckon this place justifies a few more visits as I'm dying to go try out their pork burger, which the lady kept recommending. On another note, the pork is from this farm located in Endau-Rompin that is ISO 22000 (Certification for Food Safety) certified by Moodys International. 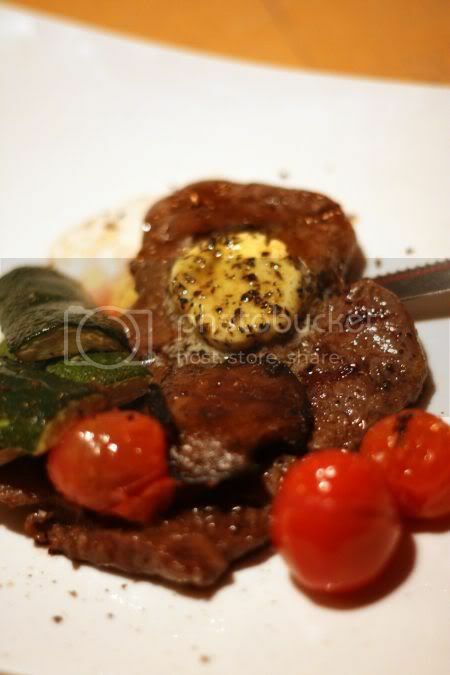 The meat is from pigs that are reared without any growth hormones. These pigs are fed a special type of bacillus using a Japanese technology. More pictures can be found in my Flickr set. Let us wind down this week by voicing out what we think about the dining scene in our own backyard a.k.a. Kuala Lumpur. 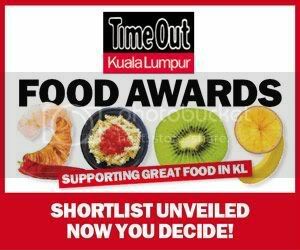 Time Out Kuala Lumpur has unveiled the shortlisted nominees for their inaugural Food Awards on their website and called for votes from the public. The winners list will be published in their December 2009 issue and to quote them, "truly reflect the opinions of the people who know the gastronomic scene". That according to them, are people like us. Correct me, if I'm wrong, but to my layman's point of view, I think Internet or even SMS voting can be skewed in some ways. One prime example is the American Idol SMS voting. Remember those shock eliminations and wins, even though certain participant's talent was questionable a.k.a that fella with the name that started with S and had funny hair. Already, I'm looking at the nominations and wondering why some categories are missing great places. For instance, in the Best Chinese Restaurant, how come iconic places like Shang Palace from Shangri-la Hotel or Overseas Restaurant are not in the list? Time Out has also lumped Thai and Vietnamese food together, hence you need to choose between those 2 cuisines, before you can even vote for your preference. What happens when you like both cuisines? Similarly for the seafood/fish category, there's no non-halal Chinese restaurant, which is truly not a true reflection of the best in town. I'm also a little confused on the best burger category - why limit that particular food item to restaurants when we know the best burgers in town are our very own Cap Malaysia Ramly Burgers!? Anyway, I rest my case on the "skewed" list of nominations and do urge all of you to click on this link to vote what you all think is best. I mean, how would I know, since I'm just a food blogger and no high-flying food critic. If I had a choice on where to live, I reckon it will be Seri Kembangan. A little out of the beaten path of the usual spots like Hartamas, Bangsar, Damansara but believe me, that small unassuming village is jam packed with loads of great food. Predominantly Hakka, this small enclave has so many yong tau foo outlets, you'll get your fair share of the fish paste stuffed goodies. Then, there's the spicy soup that warms the tummy and a proven cough remedy. 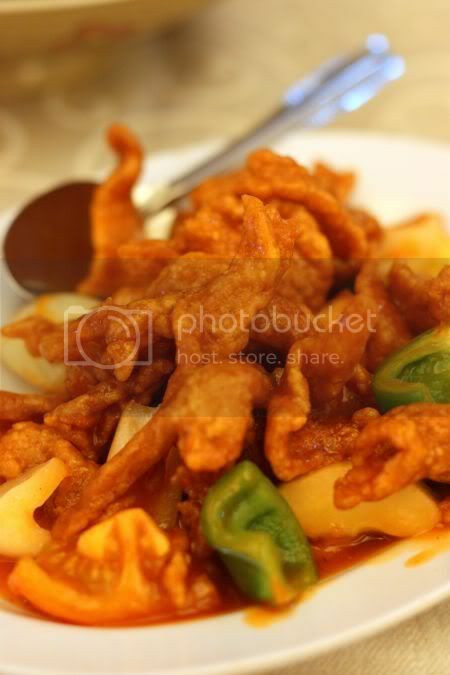 It is also a place well known for simple Chinese food. One of the famous places is Ah Lit or Ah Lek, a tai chow place that was blogged to death, a few years back when a write-up in the Chinese newspaper highlighted it. While the tai chow place still exists, the original fella who started it out has now moved out and relocated all his talented chefs to another restaurant, a little further in the village. He's gone a little more upmarket, as it is now a proper restaurant vs a shack in the middle of a residential area. 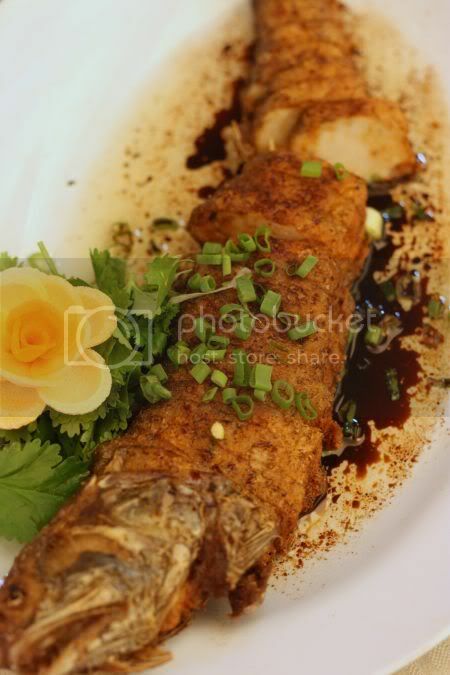 Nevertheless, they serve similar items like the other place like the stuffed ma yau fish - where the flesh is removed with the skin intact and subsequently mixed with chopped carrots and coriander before being stuffed back again. A dish that requires a lot of legwork, this was really good here with a nice springy and tasty fish filling. 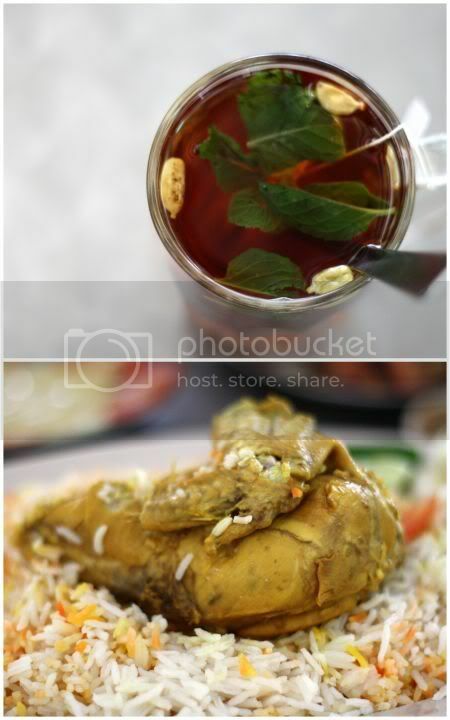 The dishes here may look simple and unassuming but try them and you'll realise, there's more to meet the eye. For instance, the salted egg yolk squid looks very unassuming and you might even ask, where's any evidence of salted egg yolk in that dish. Take one bite of the squid and you'll find the answer - the salted egg yolk is evenly coated around the squid that you don't see it but you taste the salty-sweet taste in every bite. Simply heavenly and definitely the best salted egg yolk squid I've tasted. 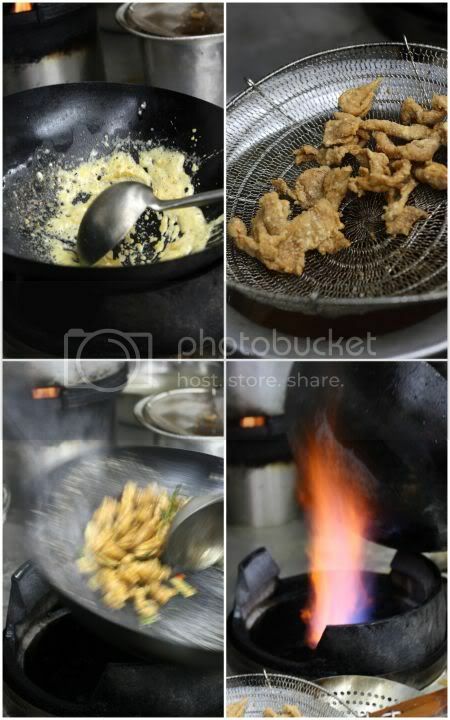 This shows how incredibly good the chef's wok skills are, as if the wok is not hot enough, the salted egg yolk will not coat the squid evenly (that's why you see salted egg yolk sauce on the side for those inferior versions). 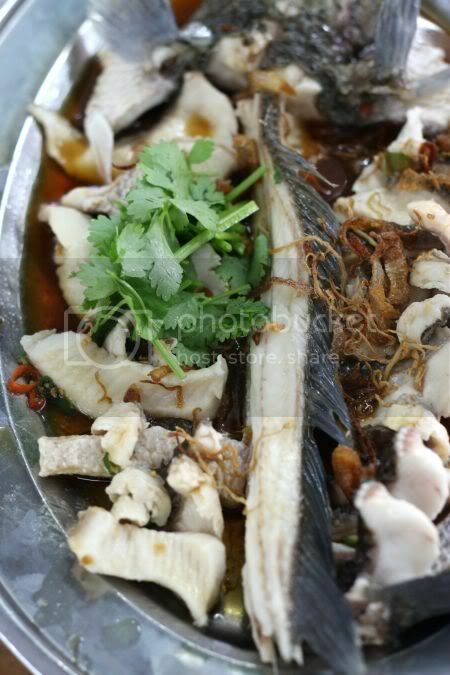 I also enjoyed their claypot curry fish head, packed with vegetables like brinjals, lady fingers and tofu puffs. 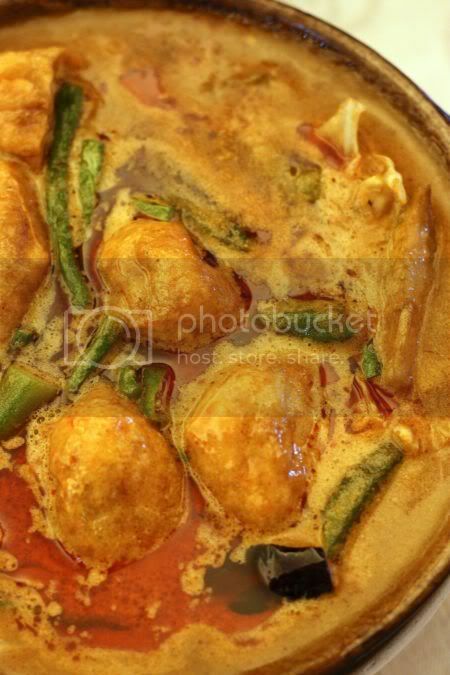 The curry was aromatic from their special curry mix and rich from the coconut milk used. 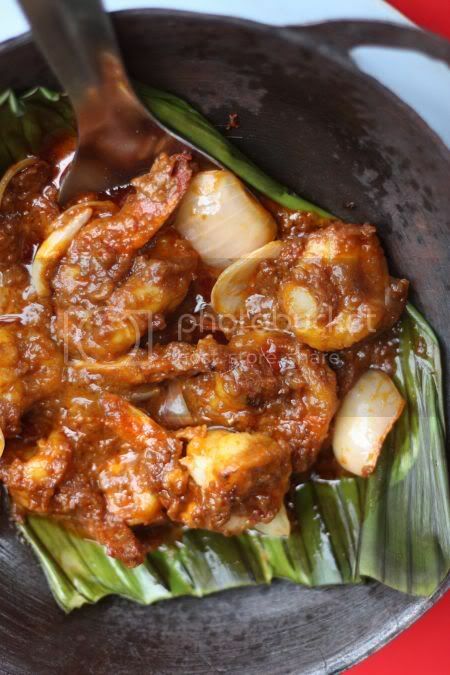 Definitely a dish to slowly relish with bowls and bowls of hot white rice to slurp down all that delicious curry. Last but not least, the traditional sweet and sour pork gets a new look here - crispy pork slices vs the boring old cube-style. It's fantastic as you get crunchy bits coated with a tangy sauce. For those based in PJ or central KL, you'll probably want to know if this place is worth a weekend drive out. Believe me, it is totally worth it as this could be the place for the best ever salted egg yolk squid. I reckon, I'm making a return trip here soon, as I would love to see, if their salted egg yolk crabs is just as good as the squid dish. 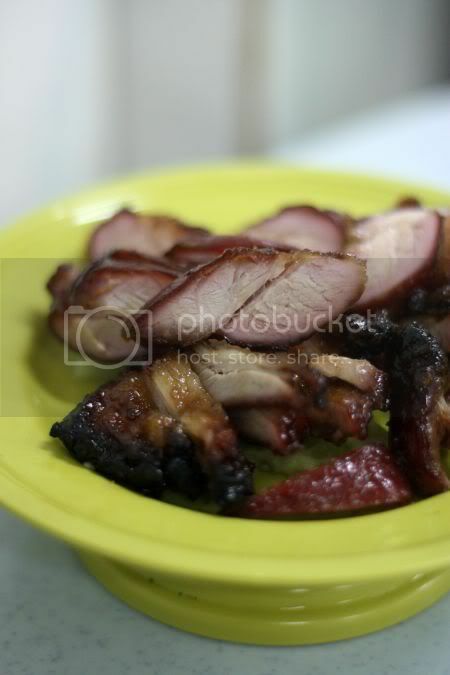 Time to update your blog or even your own personal radar on food places, Meng Kee Char Siu - that iconic place has shifted from Tengkat Tung Shin to nearby Jalan Alor. The change that happened about a month back is due to the landlord taking back the shoplot, as it changed hands. Quite sad, as that old place was full of character. They have now moved to a corner coffeeshop place that is relatively quiet during the daytime (looks like more night time activities at this place for Thai food) except for an economy rice stall. Right next to Nova Hotel, it is a pretty good location, since parking is readily available (at a price of RM5) nearby. It has been a while since I dined here, probably because I've always favoured their Glenmarie outlet (just a hop and a skip away from the office). Not sure whether it was just me but I honestly felt things were a little slow there. I was expecting almost no char siu available for me, since I was quite late for lunch but they had loads of char siu still hanging on metal skewers at the shop. It was very easy to also score a table. The test is always in the taste and one must admit that the char siu isn't as great as long ago - no melt in the mouth stickiness taste I look for and the cut they gave me was way too lean (even though I asked for half fat/half meat). Honestly, the Glenmarie version is much better, if one has to pick between the two outlets. 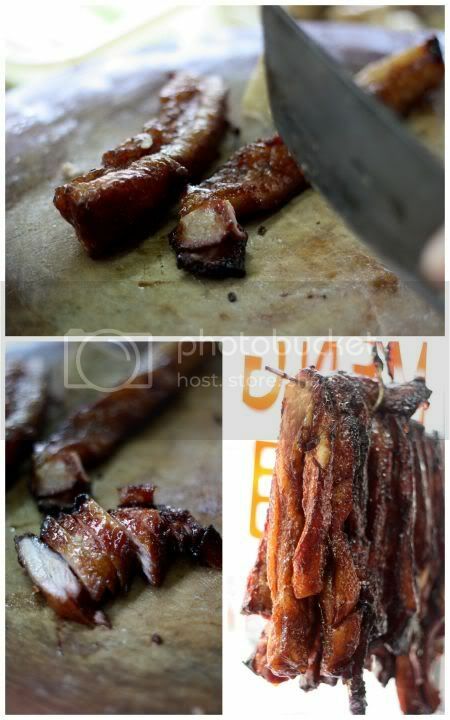 However, it is just because Glenmarie's char siu has a softer texture and a nice caramelised outer layer BUT it still does not beat other top-notch places like Famous Seremban Favourites in Sunway Mas or Spring Golden in Shah Alam. Maybe that explains the lack of people crowding at this place. 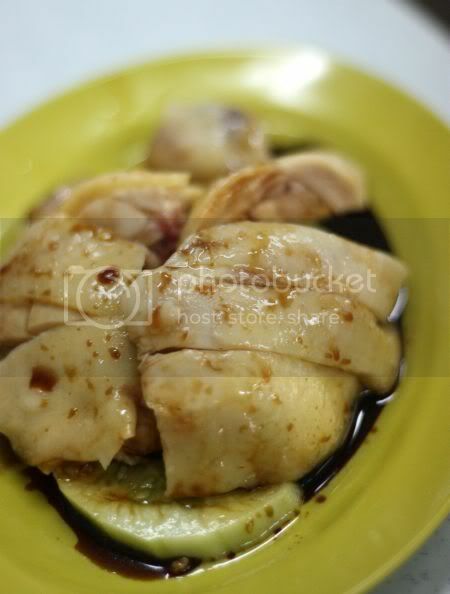 Surprisingly the poached chicken was very good (soft yet firm) and this time, they trump Glenmarie. 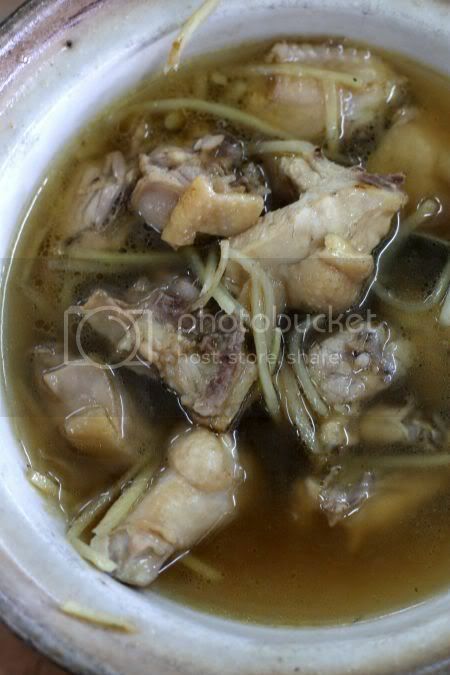 There's also healthy taugeh, if you wish to opt for a non-carbo diet (but loads of porcine goodness). For more pictures, see my Flickr set and click this link for the previous blog post. Non Halal. Open for lunch every day except Sundays. I was reminded of hotcakes last Friday (in reference to an old post I did on McDonalds's hot cakes when they made a short appearance in Kuala Lumpur) and started hankering for the sweet soft taste of fluffy and piping hot ones, straight from the pan. Since it was virtually impossible to get good ones in town, I decided to whip up a batch of hotcakes based on Bill Granger's recipe. One shouldn't hurry these - just relax and make them preferably in your comfy pajamas (with a large apron tied over them to prevent any spills) on a lazy Sunday morning. While Granger called these oaty hotcakes, I must admit they didn't have much oats in them, so please feel free to add more oats to give it a healthier edge. Once all the work is done, just sit down and enjoy these fluffy babies with the not overly sweet caramel bananas or maple syrup (if one is lazy) - they'll definitely make your day or weekend! For more pictures, see my Flickr set. 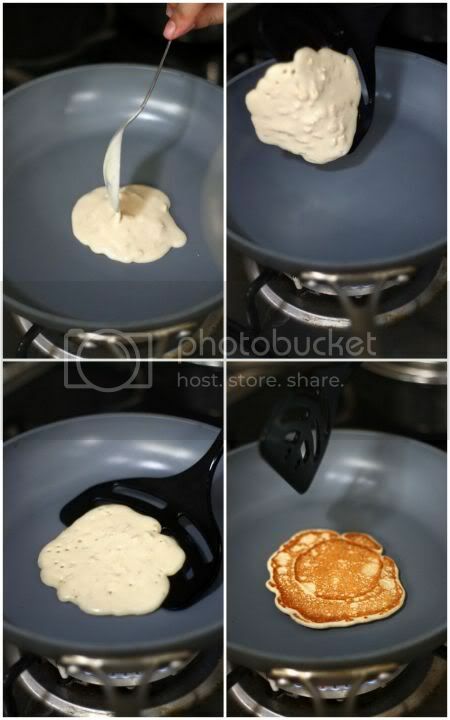 To make hotcakes: In a measuring cup, if not using buttermilk, mix white wine vinegar with milk and set aside for 5 minutes before using. Sift flour, baking powder, cinnamon and salt together. Place in a large bowl. Add sugar and oats; mix to combine. Crack an egg into the milk mixture and beat lightly. Make a well in the bowl with flour mixture, slowly add egg and milk mixture, beating lightly with a small whisk or spoon to combine. Add melted butter and stir to combine. Set aside. Heat non stick frying pan, add a little melted butter to coat pan. Once pan is hot, spoon in 2 tablespoons of batter. When bubbles appear on the surface, turn and cook for a further 2-3 minutes. Remove and continue cooking until batter is finished. You may keep the hotcakes warm in an oven before serving. 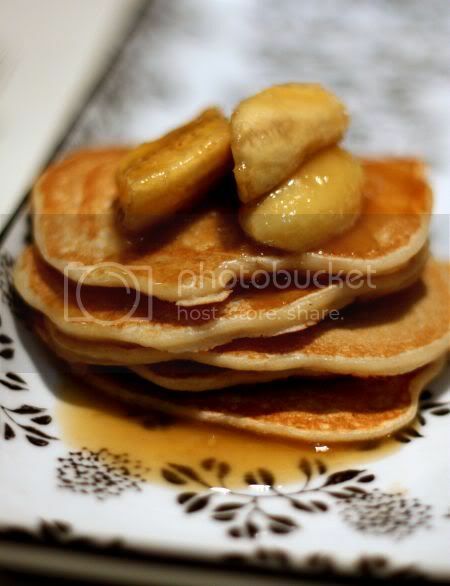 To make caramel bananas: Halve bananas lengthways and slice into three pieces. In a medium frying pan, add butter, brown sugar, vanilla extract and water. Heat over medium heat , stirring constantly until mixture forms a caramel and darkens. Add bananas and toss until combined. Remove from heat and serve with hotcakes immediately. One of the best things in being a foodie is people tend to share with you, great tips on where to eat all the time. Recently, Splashie Boy's family have been talking about this amazing find in Shah Alam - a place that sold Middle Eastern food right smack in Malay suburbia. Being a great fan of that type of cuisine, we enthusiastically tracked this place down after vague descriptions given by them. We're awfully glad we made the effort, as food was superb and best of all, very reasonably priced. The place may not look much in terms of the set up - just a simple lot in a food court. Nor did the food look impressive BUT taste the food and it will knock your tastebuds like hitting a jackpot in a slot machine. Ting! Ting! Ting! Our tastebuds went on overload with the food. 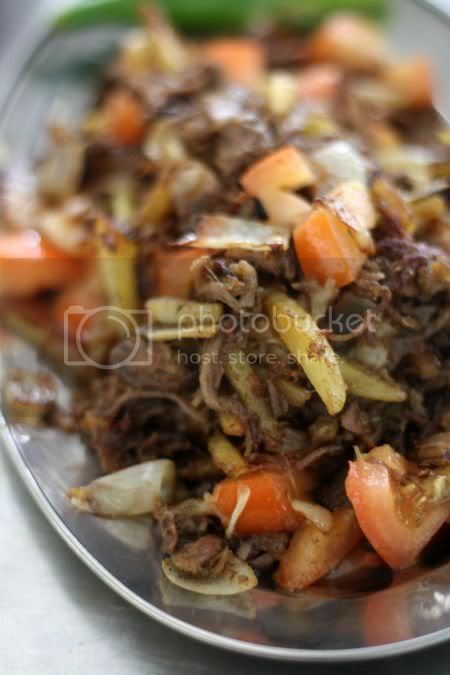 We absolutely loved the fragrant lamb aukdah (RM9 with bread) - shredded lamb fried with potatoes, tomatoes and onions. Even the simple looking chicken kabsah (RM10 for a set with briyani rice) - boiled chicken with spices comes with meat that is fork tender and so tasty, you'll have no trouble finishing the huge portions. What made the food even more special was this spicy and tangy sauce made with tomatoes, garlic and bird's eye chillies - an addictive concoction that I kept eating non-stop. Seems the stall owners also has another outlet in Bangi and they opened this place to cater to the huge Arabic student population in nearby UITM. I guess it must work as when we were eating a very late lunch there, a group of Arabic students were also eating there. 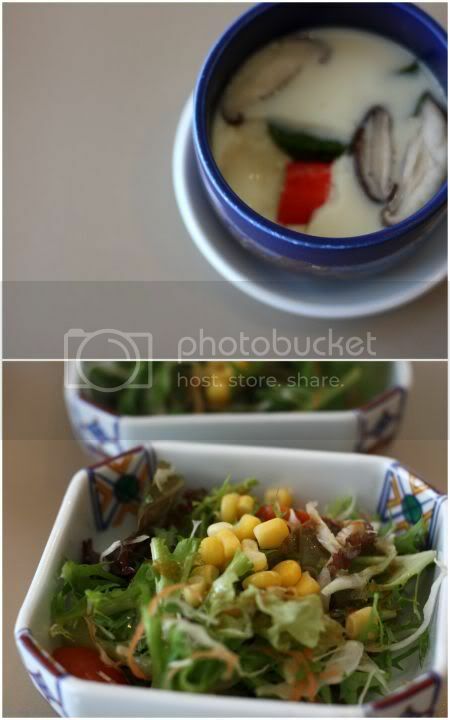 For us, we found the prices were very reasonable as the portions served were enormous. As they mainly cater to students, they try to offer the best deals here. 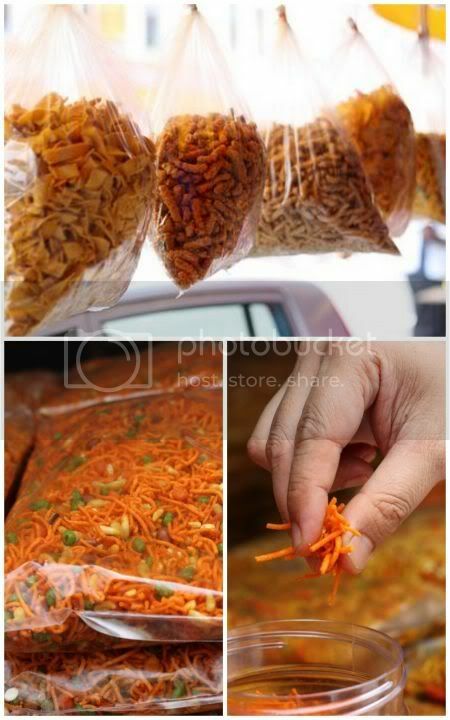 Most of the items range from RM3 to RM17. They are usually sets that are served with either rice or bread and consists of liver, omelette, roast chicken, chicken and lamb kabsah, chicken and lamb aukdah, hummus and foal - a type of red bean dip. The most expensive item on the menu is lamb hanith (RM17 with rice) - fork tender and delicious lamb with spices, cooked in a foil packet. The hummus is pretty decent here but not as smooth as other places. If you love Middle Eastern food, give this place a try as it is totally worth a drive to Shah Alam. The lady who served us, claims she used to work in the Middle East for 25 years hence she learnt to make such excellent dishes at such reasonable prices. For more pictures, see my Flickr set.